The replacement of the hose is easy, but I can't find any to buy. Has anyone seen any that will work? Or any recommendations as to where I can search? Or does this sound like something else? Should I replace the PCV valve at the same time? Only modifications is a Trubendz Magnaflow 2.5 stainless and audio. Last edited by nayman898; 03-22-2019 at 11:45 AM. I woukd replace the valve at the same time. Do you have a SVT? Your "What I Drive:" info would not indicate you have a SVT. want to make sure I am using a correct enegine. None of the items that Rock Auto has are the ones I'm looking for, believe me I tried. The breather hose was already replaced because that's what every shopping site calls the PCV hose, but the one I'm looking for goes underneath the intake, connects to what the first item at that page connects to, right below the distributor then travels under the intake and connects right after the throttle body. on my SVT the elbow attaches to a riged metal pipe. I am sure it has another rubber hose but still working getting to know the unique bits to teh SVT vs regular. and I have deleted my PVC long ago on my Zetec motor. Did you find the hose ? I got all 3 pieces from Ford, the long hose, the short 90 degree hose, and the metal tube. Wasn't that expensive. If the hose picced there I'd be using bulk straight hose with likely an adapter made up for the end where it looks bigger and for pennies. Get the parts anywhere. I found a resolution to the issue I was having. I replaced the PCV hose and the engine sputtering on acceleration died down, but didn't stop entirely. So I decided to take a look at the spark plugs, I took off the cover, and there was a small puddle of oil around the VCT Solenoid. 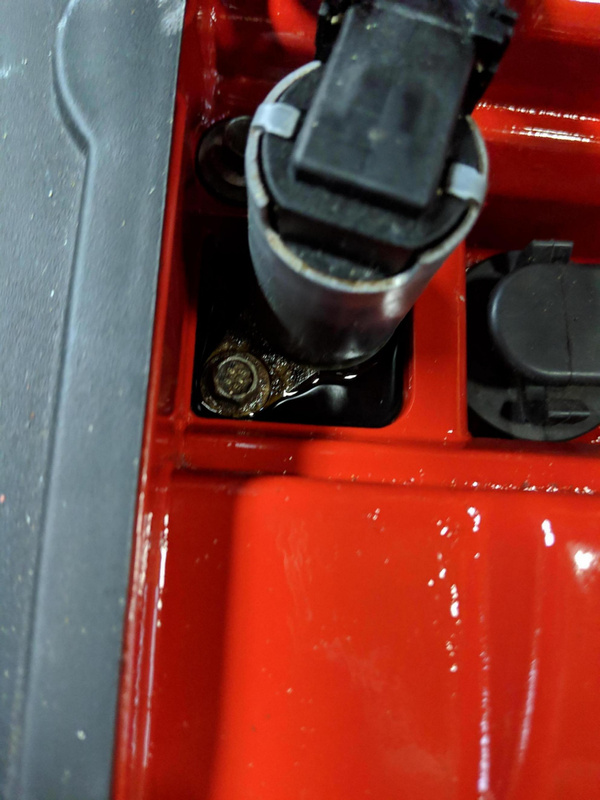 (that's after I replaced valve cover, but same thing before) The issue. 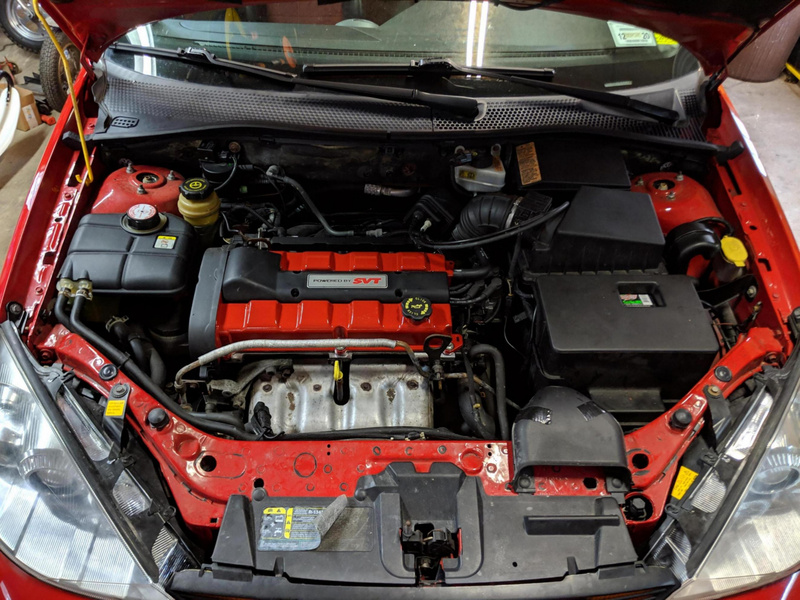 At first I thought it would be the valve cover gasket, so I bought another one and put it in, (painted my valve cover while it was off) and put it back on, fired the engine up, within 5 seconds that little puddle was back. So I looked more into the solenoid and noticed that if I put it on flush, and tightened the bolt, it would pull the opposite side from the bolt off. So i took the top half off and the bracket was somehow bent. I bent it straight and put a washer between the bracket and the engine block and the solenoid when on perfectly straight. Ran the engine for a little, no oil. I thought for sure when I saw the oil there it would be the whole solenoid needing to be replaced. Driving it for 2 days since, issue with sputtering is gone, and the engine feels more alive. Disregard the tape on the snorkel, whoever owned it before me broke the snorkel so it doesn't stay together.